Increasing starch or neutral detergent fiber (NDF) digestibility in whole-plant corn silage (WPCS) may increase lactation performance by dairy cows or reduce purchased feed costs for dairy farmers. The digestibility of the kernel or starch (StarchD) in WPCS is influenced primarily by kernel processing (Ferraretto and Shaver, 2012; Ferraretto and Shaver, 2013). The digestibility of the stover or NDF (NDFD) in WPCS is influenced primarily by the WPCS hybrid grown (Ferraretto and Shaver, 2012; Ferraretto and Shaver, 2013). This Focus on Forage paper will discuss the potential impact that ensiling may have on StarchD and NDFD based on the available research data. Ensiling effects on digestibility are important because: 1) the feeding value of WPCS may be changing over time in storage prior to feeding, and 2) WPCS hybrid performance trials, which include digestibility measurements, are typically conducted using un-ensiled whole-plant samples (Lauer et al., 2013). Does ensiling increase the digestibility of starch in WPCS? Results from 4 experiments which addressed this question are in Table 1. Ensiling consistently increased ruminal in vitro measurements of StarchD (ivStarchD) and the greatest ivStarchD values were observed at longer ensiling times. Similar results were reported by Fish (2010) using an index of ivStarchD with 0-, 30- and 120-day silo fermentation times. Ensiling for up to 6 months increased ivStarchD by 15 percentage units, on average, in the trials summarized in Table 1. Ensiling high-moisture corn grain (HMC) for 240 days reduced zein protein subunits that cross-link starch granules suggesting that the endosperm starch-protein matrix was degraded by proteolytic activity over an extended ensiling period (Hoffman et al., 2011), which would also explain the observed effects of ensiling on ivStarchD in WPCS. 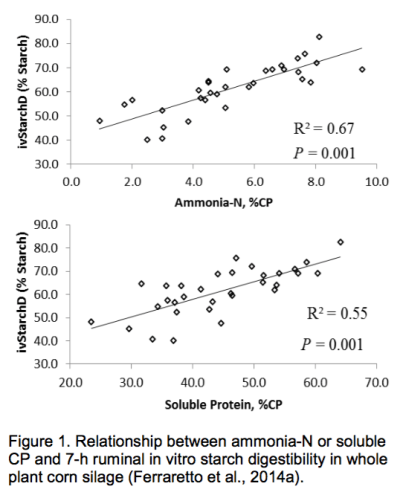 Supporting this premise are observations of strong positive correlations between ammonia-N or soluble-CP concentrations and ivStarchD for both WPCS (Ferraretto et al., 2104a; Windle et al, 2014; Der Bedrosian et al., 2012; Young et al., 2012) and HMC (Ferraretto et al., 2014b; Hoffman et al., 2012; Hoffman et al., 2011). The regressions between WPCS ammonia-N or soluble-CP and ivStarchD of Ferraretto et al. (2014a) are in Figure 1. These nitrogen fractions may be useful indicators of changes in StarchD over time in storage for WPCS, however, more research is needed to develop and validate predictive equations. For WPCS ivStarchD, the following interactions (P < 0.05) with ensiling time have been reported: hybrid (Der Bedrosian et al., 2012), hybrid by dry matter (DM) content (Der Bedrosian et al., 2012), protease addition (Windle et al., 2014; Young et al., 2012), DM content (Windle et al., 2014), and protease addition by DM content (Windle et al., 2014). Fish (2010), in a study of 33 WPCS hybrids in 3 relative maturity groups over 2 years at 3 locations in WI with 0-, 30- and 120-day ensiling times, reported a hybrid by ensiling time interaction (P < 0.03) for an index if ivStarchD in the early but not mid or late relative maturity trials. Measurements of ivStarchD have not yet been included in WPCS hybrid performance trials (Lauer et al., 2013), and these findings suggest that further investigation of potential interactions between ensiling time effects and hybrid, maturity and silage additive effects is warranted before doing so. Furthermore, determination of ivStarchD, or nitrogen fractions that may serve as indicators of ivStarchD, during silage feed-out is highly important because of changes in ivStarchD that occur over the ensiling period and potential interactions that may exist between ensiling time effects and hybrid, maturity, and silage additive effects. On-hand WPCS and HMC inventory planning so that the newly harvested crop will not need to be fed for at least 4 months in storage is a valid management practice. 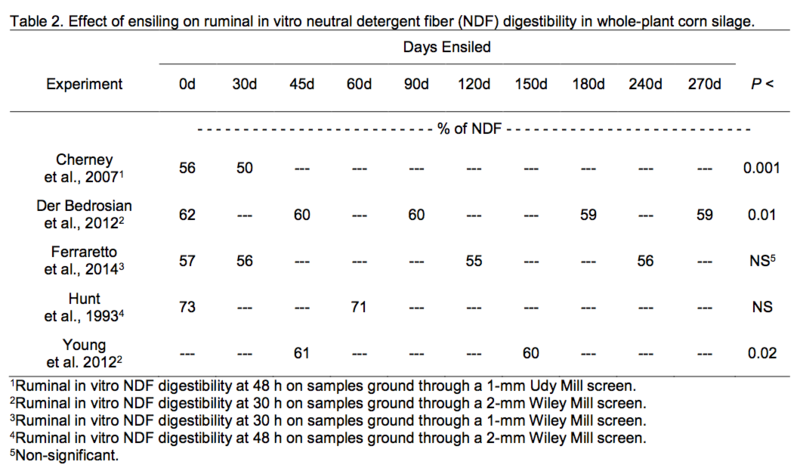 Does ensiling increase the digestibility of NDF in WPCS? Results from 5 experiments which addressed this question are in Table 2. Although, ensiling had minimal impact on ruminal in vitro measurements of NDFD (ivNDFD) there tended to be a slight reduction (only 1 to 2 percentage units in 4 of the 5 trials) for ensiled WPCS (30 to 60 days of fermentation) compared to un-ensiled whole-plant samples with little further change noted in WPCS ivNDFD at prolonged storage times. Similar results were reported by Fish (2010) using a modified ivNDFD procedure. Small reductions in WPCS ivNDFD are likely related to hydrolysis of some hemicellulose early on during the silage fermentation, which thereby results in lower digestibility for the remaining NDF. No ensiling time by hybrid interactions (P > 0.10) were detected for ivNDFD in the multiple-hybrid performance trials of Ferraretto et al. (2014a), Fish (2010), Cherney et al. (2007), or Darby and Lauer (2002). Therefore, WPCS hybrid selection and ranking hybrids based on ivNDFD can continue to be performed using un-ensiled sample results (Lauer et al., 2013). Determination of ivNDFD during silage feed-out is recommended, however, to obtain the most accurate sample results for feeding purposes. Cherney, D. J. R., J. H. Cherney, and W. J. Cox. 2007. Forage quality differences of corn hybrids as influenced by ensiling. Forage and Grazinglands. 10.1094/FG-2007-0918-01-RS. Darby, H. M., and J. G. Lauer. 2007. Harvest date and hybrid influence corn forage yield, quality, and preservation. Agron. J. 94:559-566. Der Bedrosian, M. C., L. Kung, Jr., and K. E. Nestor, Jr. 2012. The effects of hybrid, maturity and length of storage on the composition and nutritive value of corn silage. J. Dairy Sci. 95:5115-5126. Ferraretto, L. F., and R. D. Shaver. 2012. Meta-analysis: Impact of corn silage harvest practices on intake, digestion and milk production by dairy cows. The Prof. Anim. Sci. 28:141-149. Ferraretto, L. F., and R. D. Shaver. 2013. Meta-analysis: Effects of corn silage hybrid type on intake, digestion, and milk production by dairy cows. J. Dairy Sci. 96(Suppl. 1):214 (Abstr.). Ferraretto, L. F., R. D. Shaver, S. Massie, R. Singo, D. M. Taysom, and J. P. Brouillette. 2014a. Effect of ensiling time on fermentation profile and starch digestibility in whole plant corn silage from two different hybrid types. J. Dairy Sci. 97(E-Suppl. 1): (Abstr.). Ferraretto, L. F., K. Taysom, D. Taysom, R. D. Shaver, and P. C. Hoffman. 2014b. Relationships between dry matter content, ensiling, ammonia-nitrogen, and ruminal in vitro starch digestibility in high-moisture corn samples. J. Dairy Sci. 97:3221-3227. Fish, C. M. 2010. The effect of fermentation on forage quality ranking of corn hybrids. M.S. Thesis, University of Wisconsin-Madison. Hoffman, P. C., N. M. Esser, R. D. Shaver, W. K. Coblentz, M. P. Scott, and A. L. Bodnar. 2011. Influence of ensiling time and inoculation on alteration of the starch-protein matrix in high-moisture corn. J. Dairy Sci. 94:2465-2474. Hoffman, P.C., D.R. Mertens, J. Larson, W.K Coblentz, and R.D. Shaver. 2012. A query for effective mean particle size in dry and high-moisture corns. J. Dairy Sci. 95:3467-3477. Hunt, C.W., W. Kezar, D.D. Hinman, J.J Combs, J.A. Loesche, and T. Moen. 1993. Effects of hybrids and ensiling with and without a microbial inoculant on the nutritional characteristics of whole-plant: corn. J. Anim. Sci. 71:38-43. Windle, M. C., N. Walker, and L. Kung Jr. 2014. Effects of an exogenous protease on the fermentation and nutritive value of corn silage harvested at different dry matter contents and ensiled for various lengths of time. J. Dairy Sci. 97:3053-3060. Young, K. M., J. M. L im, M. C. Der Bedrosian, L. Kung Jr. 2012. Effect of exogenous protease enzymes on the fermentation and nutritive value of corn silage. J. Dairy Sci. 95:6687-6694.